This is a recipe I learned from a guy I used to work with. It’s a simple, fast, and super delicious dish that can be re-interpreted in a variety of ways. I was once served a version of this made with leftover salsa and nachos – and it was pretty good. You can make this in much less time than it takes to discuss it, and it’s barely harder than basic scrambled eggs. So give it a shot! 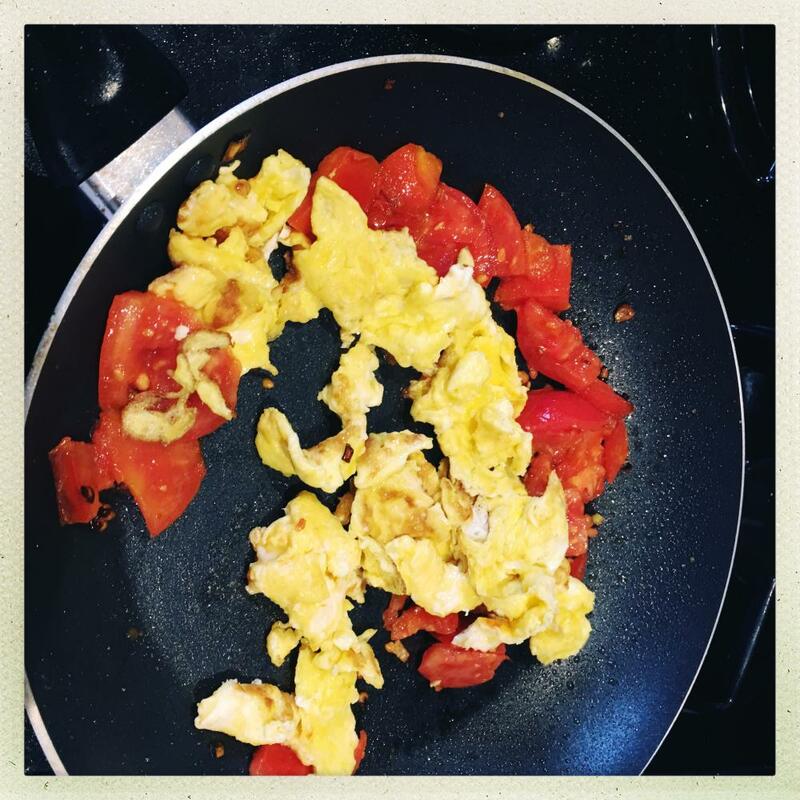 You want tomatoes and eggs, and some butter and oil and a green onion. 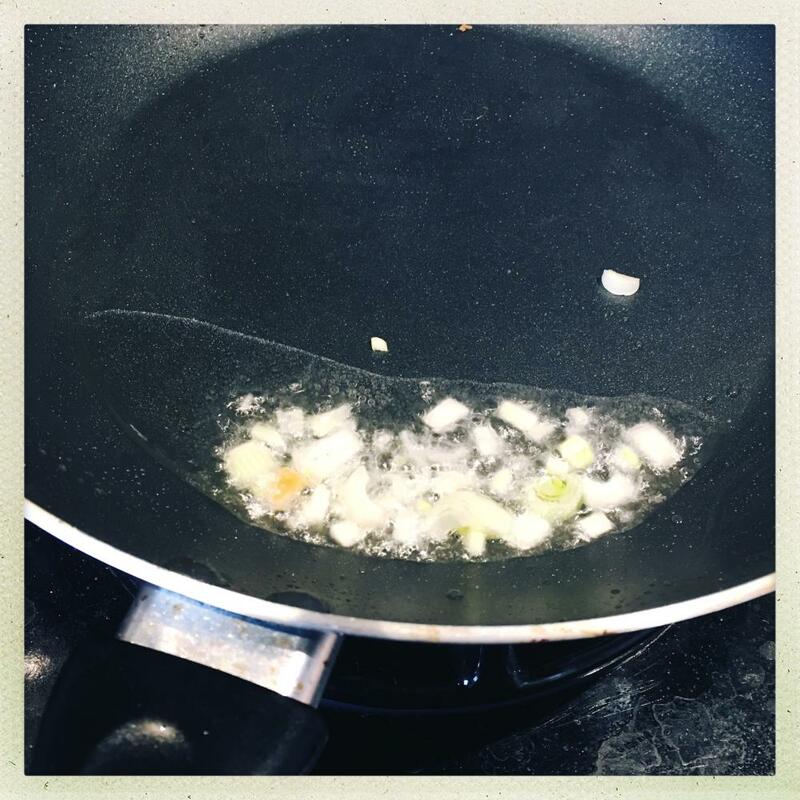 If you don’t have a green onion you can use anything onion-like, or garlic, or just leave it out. But since I’m trying to explain how this recipe is done correctly I’m going to assume we’re using the standard options. 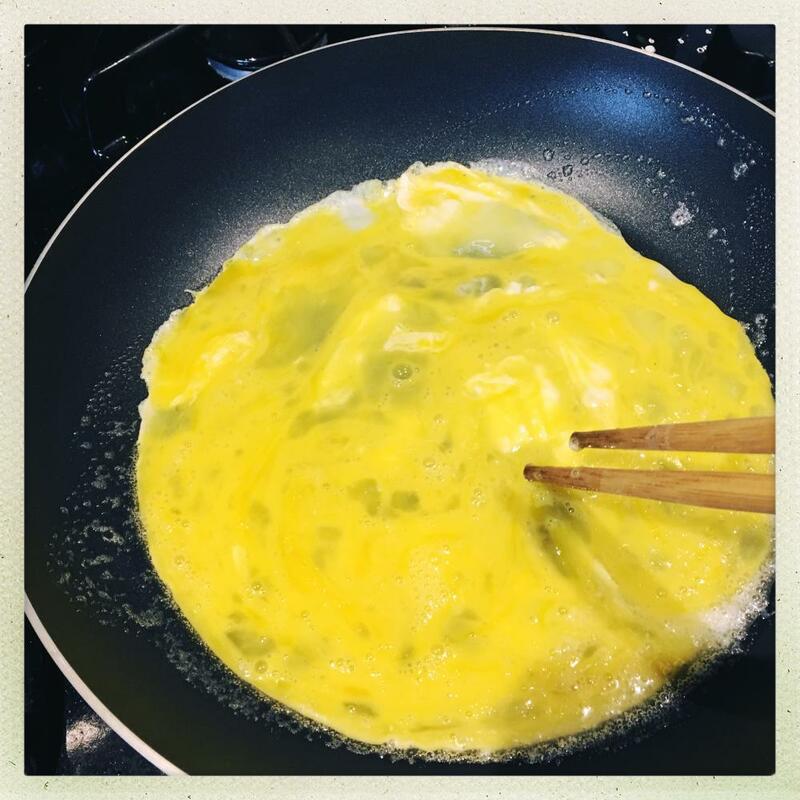 While the eggs are scrambling, cut up the tomatoes and the green onion. I set aside a few pieces from the stem as a garnish, and then dice the bottom. When the eggs are cooked (I like them slightly browned) tip them back into the bowl. Then take some oil and keep the pan hot, adding the onion. lightly caramelize the onion in the oil to bloom the flavor while you get it hot. Add the tomatoes to the hot oil. It will make a mess. 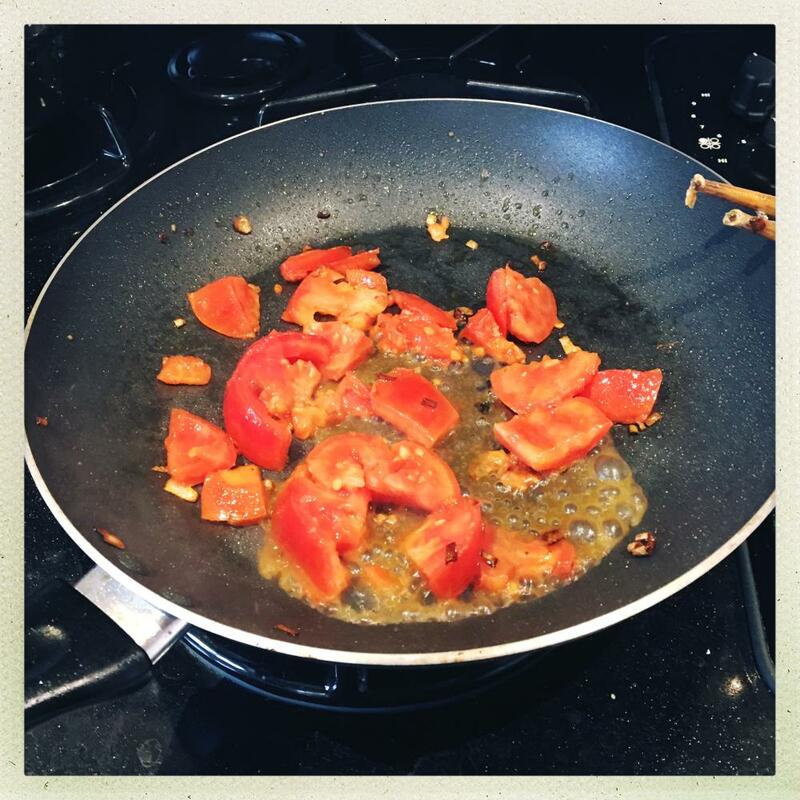 It should make a mess – you just added moist tomatoes to hot oil! The objective here is to cook the tomatoes a bit to soften them and get them to release a bit of juice with the oil. If you have really juicy tomatoes (it’s early spring here, good tomatoes are not an option!) you will get plenty of juice. 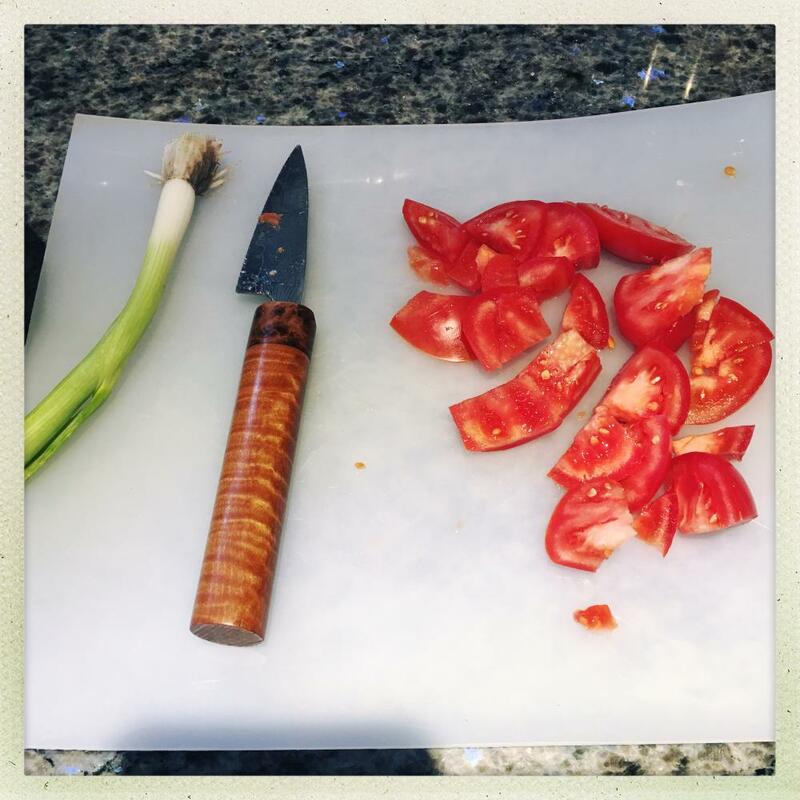 If you have dry winter tomatoes, you can add a couple tablespoons of water and cook the whole thing down. Then add the eggs back in and mix the whole mess up a bit. If you want to add 2 or 3 drops of toasted sesame oil, at this point, you can, but you don’t have to. Turn it back out onto your plate, and garnish with the green bits of stem. If you have fresh cilantro, that’s another option. Basil works well, too. Shown here with cholula sauce. Sometimes I add a bit of chipotle sauce. Those are not traditional szechuan style, but it works. I disagree completely. The mise en place should be complete before anything touches a pan. On a more positive note, if you like Chinese food I can highly recommend Fuchsia Dunlop’s book: Dunlop, F. (2013). Every Grain of Rice: Simple Chinese Home Cooking (1st edition). New York: WW Norton. Assuming you have a reasonably handy source of Chinese ingredients you can turn out some excellent dishes. I live in a fairly small city (125K); finding spicy fermented bean curd was easy but Cassia bark was a challenge, and so on. Dunlop trained at a cooking school in Chengdu and seems to have been obsessed with Chinese food since the first day in Chengdu when she was nominally attending the local university. Her scrambled eggs and yours are almost identical though no butter and she suggest a bit of potato flour at the last minute but it’s optional. Sichuan peppercorns and garlic and ginger would help increase the Sichuan-ness. 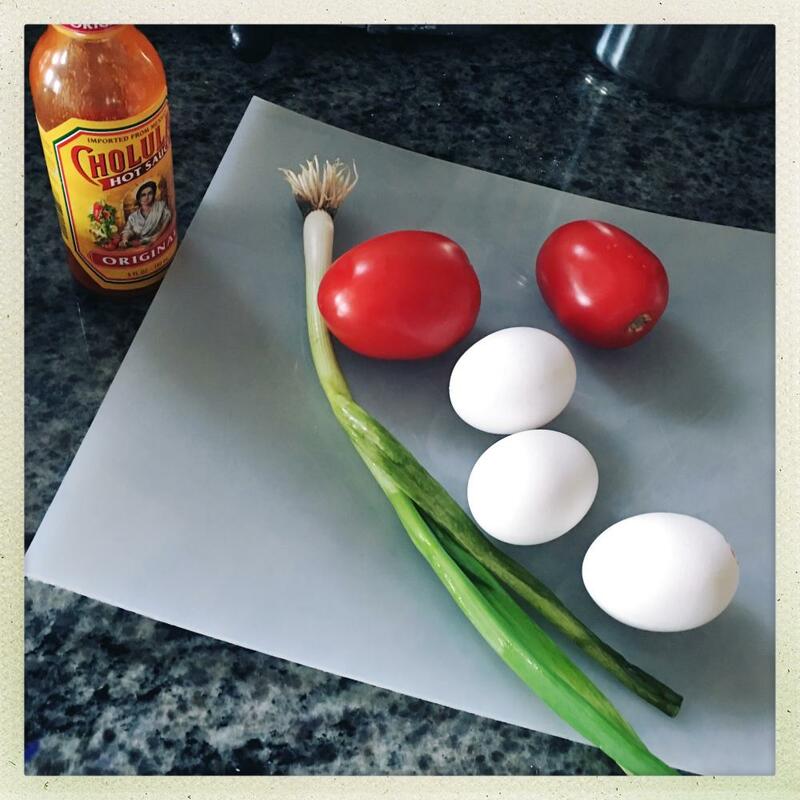 Cholula, while delicious, has a very Americas flavor to it. Sriracha or even a sambal would be closer to the Sichuan palate. I definitely agree if one wants a bit of bite that Sichuan peppercorns make sense. I have no idea what Cholula is but would not just a bit of Chinese chili oil help? I’m a trifle doubtful about the Sriracha which might overpower the other flavours such as the sesame oil whereas the chili oil should give some heat but has a more neutral flavour. I try to have a tin of smoked mussels in oil on hand, so if I have some leftover rice I can make a ‘Beggar’s Paella’ with some fried egg and sausage (‘Poor Man’s Paella’ seems to have already been taken). 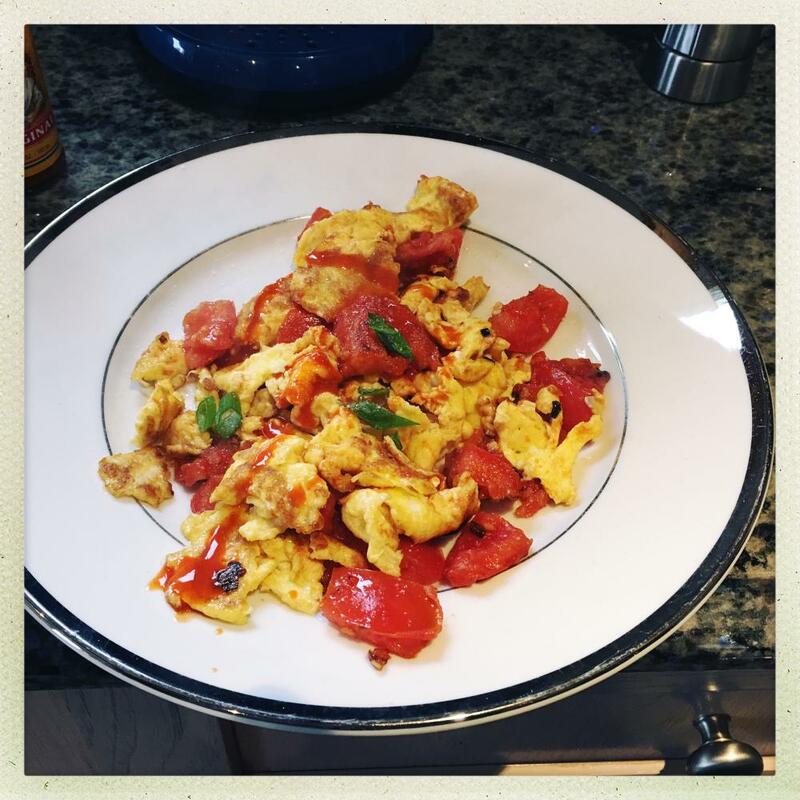 Have tried the scrambled eggs plain and with a) Sriracha, green Tobasco Sauce, Chinese Chili Oil and spicy fermented tofu as dips. Plain is lovely and as I suspected the chili oil adds a bit of bit without overwhelming the original flavours. Second try was with a bit of chili oil added as I scrambled the eggs. Again good results. I think the other three condiments tended to overwhelm the eggs and tomatoes. In any case, great recipe Marcus. The mise en place should be complete before anything touches a pan. I can understand with something where bacteria’d be a problem (e.g. : chicken on a warm day) but otherwise it’s a question of how fast you are. Unrelated: when I am doing food prep for something large I use stacking polypropylene sheets that I get from ridout plastics and table-saw to size. More info is here. I bet the chili oil was really good!!! Darn, now I’m going to have to try that. I only used the cholula sauce out of sheer laziness. I thought sriracha’d be too hot, and ketchup too sweet, so I was down to chipotle sauce or cholula as my choices. Cholula is, basically, tabasco. Glad you enjoy it. I can’t claim credit for this one, but I will say I eat it a lot.